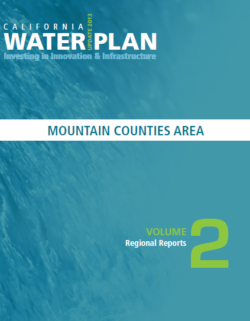 Mountainous regions provide most of the state’s water supply. But major problems loom— from a growing risk of wildfires to a shrinking snowpack. 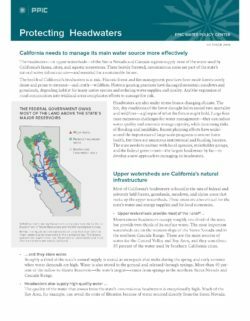 This brief outlines ways California and the federal government—the largest landowner in headwater areas—could address critical problems in these areas. 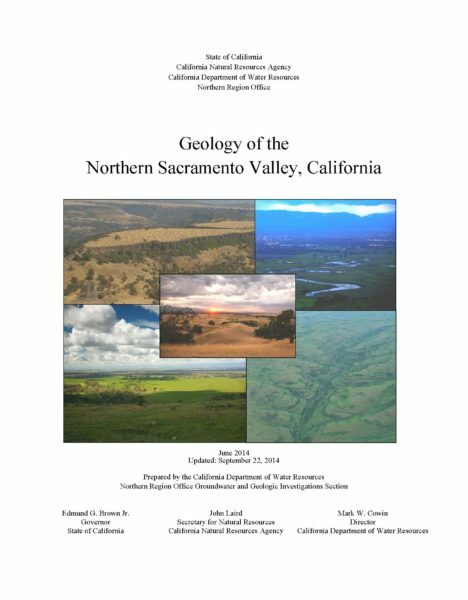 This study describes the complex geology of the northern Sacramento Valley, focusing on the Late Cenozoic geologic formations and structures that compose or influence the valley’s fresh groundwater aquifer formations. The California Department of Water Resources (DWR) acquired geologic data from groundwater observation well drilling operations that were conducted in the valley over the last 15 years. Using the observation well drilling data, DWR evaluated and classified the lithology of the subsurface sediments, implemented petrographic sand provenance analyses on lithologic sediment samples, and reviewed associated geophysical logs from each bore hole. In addition, DWR conducted an extensive literature review of published and unpublished data and then integrated the data to produce this geologic report, map, and cross sections that describe the geology of the northern Sacramento Valley. Results from the lithologic logging, petrographic analyses, and data review show that the heterogeneous sediments of the northern Sacramento Valley’s most productive groundwater-bearing geologic formations, the Tehama Formation and the Tuscan Formation, intermix in the subsurface in various areas near the center of the valley. The results also show that toward the westward and eastward extents of the valley, the sediments of the formations become more unified in composition due to the proximity of their respective sediment source areas. However, because of the depositional environment of the geologic formations, sediment sizes within the formations can be discontinuous and intermittent in places, resulting in variable groundwater aquifer zones within the geologic formations. Additional data are needed to further define the northern Sacramento Valley aquifer system. Drilling and installing groundwater observation wells in areas of little or no data can provide the information needed to determine the extent and variability of the valley’s groundwater aquifers. Groundwater level data supplied by the observation wells can provide valuable information for monitoring aquifer conditions, for determining the change in groundwater levels over time, and for assessing the ability of groundwater to move through the geologic aquifer sediments. In addition, a textural analysis of formational sediments using lithologic cuttings and/or driller’s well logs could be performed to better identify aquifer production zones. In summary, the geology of the northern Sacramento Valley is diverse and has a widely varied historical sequence of earth-shaping events. It includes periods of time when much of the area was below sea level, multiple and distinct periods of volcanic activity, several periods of mountain building, and intermingled periods of massive erosion and deposition. Analyses of the data illustrate the heterogeneity of the groundwater-bearing geologic formations in the subsurface, and the intermixing of formational sediments toward the center of the northern Sacramento Valley, resulting in a region with great geologic and hydrogeologic complexity. 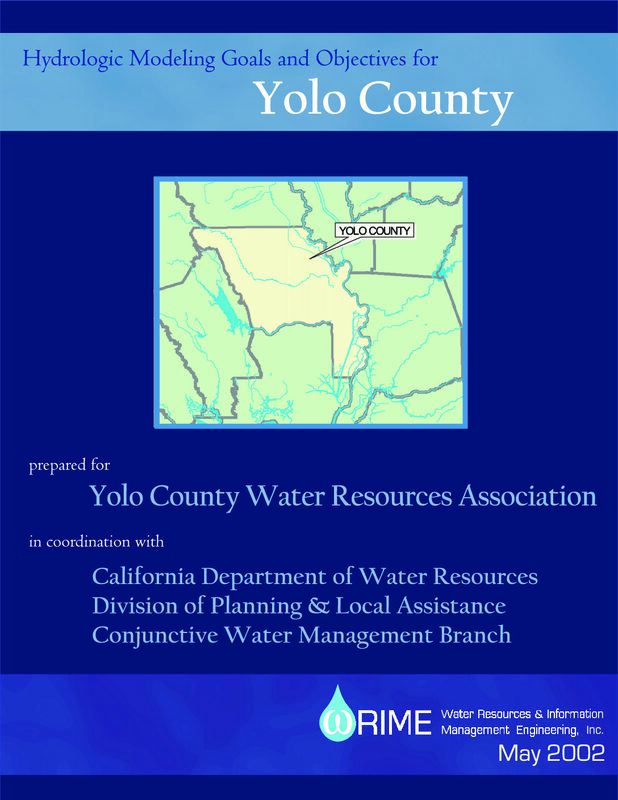 The Water Resources Association of Yolo County (WRA) has entered into a Memorandum of Understanding (MOU) with the California Department of Water Resources (DWR) to cooperatively investigate conjunctive use opportunities in Yolo County. As part of the MOU, DWR is assisting the WRA to develop goals and objectives for a combined groundwater and surface water model of Yolo County, including a modeling strategy. As DWR’s contractor, WRIME, Inc., in collaboration with the DWR, WRA, and other consultants with modeling experience/knowledge about Yolo County, conducted the modeling assessment study. 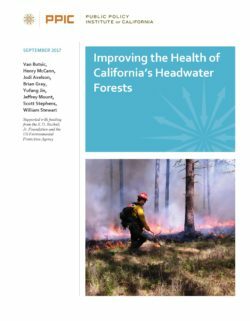 California’s headwater forests are not thriving under current management practices, and changes are needed to make them more resilient to periodic drought and long-term climate change. More active management of these lands is needed to improve forest health, reduce the risk of major wildfires and pest infestations, and maintain the flow of benefits provided by this critical natural infrastructure. Decades of fire suppression, an emphasis on short-term management priorities, weather extremes, and a warming climate have set the stage for the decline in forest resilience. Two-thirds of the state’s surface water supply originates in these mountainous forests. California stands to lose timber production, wildlife habitat, recreational opportunities, and water supply if this vital natural infrastructure continues to decline. Management options exist—prescribed fire, managed wildfire, mechanical thinning, and forest pest treatments—that can help rebuild resilience in these forests and prepare them for a challenging future. This report identifies 138 rivers and streams for instream flow studies. The total estimated cost to conduct scientific instream flow studies for the high priority rivers and streams tributary to the Delta is $32.46 million. The total estimated cost to conduct scientific instream flow studies for the high priority rivers and streams outside the Delta watershed is $107.25 million. 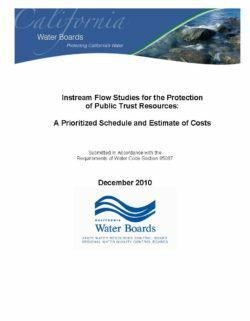 The detailed schedules and costs are preceded with a few short discussions on the timelines given in the directive, the organization of schedules, the cost estimates for instream flow studies, and cost estimates for the next logical step: setting instream flow objectives. There is a growing understanding that many Sierra Nevada forests are not healthy and that overgrown forests are susceptible to disease and intense wildfire. 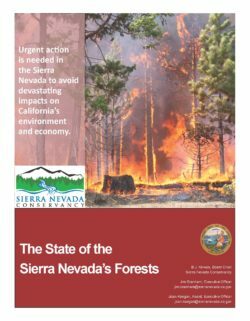 There is likewise broad consensus that science-based ecological restoration of our Sierra Nevada forests must be dramatically increased in order stem the tide of large, uncharacteristic wildfires. These wildfires threaten the very lifeblood of California -- the forested watersheds of the Sierra Nevada. The Region is the origin of 60% of California’s developed water supply. The forests of the Sierra Nevada store massive amounts of carbon, assisting in the state’sefforts to combat climate change. The forests and watersheds provide crucial habitat to hundreds of species. The area provides world-class recreational opportunities enjoyed by millions from around the world. The Region is a major producer of wood products and hydro-electric power. The United States Forest Service Region 5 (USFS) estimates that between six and nine million acres of lands for which they have management responsibility are in need of restoration. In order to return these lands to ecological health, a two to three times increase in the pace and scale of ecological restoration must occur. The amount of area consumed by fire in the Sierra Nevada continues to increase. More land has burned in the first four-and-a-half-years of this decade than seven entire decades in the past. Between 1984 and 2010, there was a significant increase in the number of acres within a forest fire burning at high-intensity, from an average of 20% in mid-1980s to over 30% by 2010. High-intensity burn areas can experience runoff and erosion rates five to ten times greater than low- or moderate-intensity burn areas. The sediment that is carried in the runoff not only degrades water quality and damages infrastructure, it fills reservoirs, reducing storage capacity. The 2013 Rim Fire, the largest fire in the recorded history of the Sierra Nevada, burned 257,000 acres, almost 40% of which was at high intensity. Estimates are that that fire produced the same amount of greenhouse gas emissions that 2.3 million vehicles produce in a year. 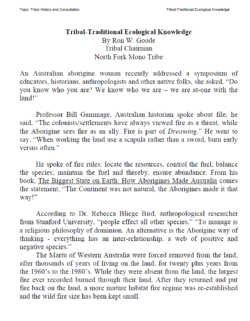 A memo written by Ron W. Goode, Tribal Chairman, North Fork Mono Tribe on Traditional Ecological Knowledge and the use of fire. 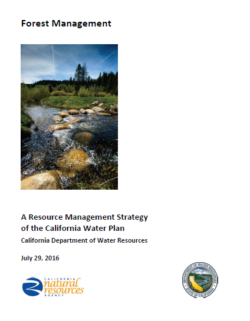 This document was part of the reference documents included with the California Water Plan 2013 Update.